FIRST THOUGHTS: Historical revisionism has never been so much fun. This book is quite a bit longer than my usual fare, but I flew through it. It's great fun, not to mention hilarious; it's even better if you actually know a bit of the history of the House of Tudor. (Hey, Showtime's finally good for something!) I normally have trouble with historical fiction, but this proved to be an exception. Which may not be surprising, since the narrators outright admit they're chucking history directly into the trashcan for this one. I'd best describe it as "The Princess Bride" meets "The Tudors." With a bit of "Monty Python" thrown in for good measure. THOUGHTS ON PLOT: This plot has a little something for everyone. Political schemes, arranged marriage, betrayal, persecuted fantasy creatures, storming the castle, and, of course, teenage girls getting married to guys that turn into horses. It's very fast-paced, starting right when Edward finds out he's dying, and proceeds to wander all over history, occasionally stumbling over something that actually happened, but mostly doing it's own thing. And honestly, that's for the best. Even if you ignore the whole E∂ian thing, this is not historically accurate by any stretch, but it's a very funny "what could've been" tale. Like I said, the story moves very quickly, but never so much so that you lose track of what's going on. (It changed some people's names for the sake of the narrative, which helps -- I swear, historical nobles only seemed to have 10 or 12 names to go around.) It's also very addicting. I finished it in barely a week. And once Jane became queen, things got so interesting, that I finished the book that same day. THOUGHTS ON CHARACTERS: The main players of this book are Jane, G, and Edward, and the narrative cycles through which one of them is getting the focus at any given time. All are very likable leads (Edward less so, at least at the beginning), and all of them undergo a remarkable amount of character development. The characters also have fantastic chemistry and banter with each other, especially Jane and G. As much as they bicker and clash at first, you're rooting for them as a couple right from the beginning. My favorite character was, naturally, Lady Jane herself. She's clever and capable, but naive and inexperienced in a way that makes her very relatable. She sticks to her principles and can argue like hell, but she has a softness about her that allows her to be vulnerable at times, allowing the reader (and the other characters) to get to know her. My one real complaint with the characters is how simplified Elizabeth and Mary were. It's true that Elizabeth was, by most accounts, intelligent and reasonable, and Mary was vicious and ambitious, but I felt like the narrative reduced them down to mere cardboard cutouts of their historical reputations. They served their narrative purpose, and they were both decent enough characters, but I would've liked to see more depth. THOUGHTS ON WRITING STYLE: The Lady Janies are all very good writers. I've never read anything from them before, but I hope this work is an indicator of their usual standard. The narration is hilarious and anachronistic, rife with references to everything from Shakespeare to Game of Thrones to The Princess Bride. It's also a very self-aware novel. The characters aren't aware of how ridiculous this all is, but the narrators very much are, and it's all the better for it. The prose isn't too complicated or too bare, and it gives you just enough actual historical fact to get yourself situated before it punts historical fact out the window. This is one of the few books that's actually made me laugh out loud -- and I think you will, too. FINAL THOUGHTS: Highly, highly recommended, especially if you're looking for something light and fun. I'd be eager to see this book get made into a film (or perhaps a miniseries), and I'm especially eager to see any future books The Lady Janies put out together. I've never read anything from any of them before, but if this book is any indication, they make a fantastic team, one I hope to see produce many more stories in the future. 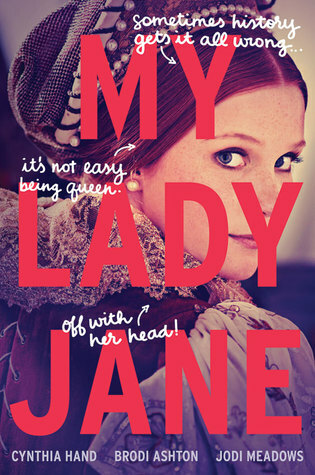 Have you read "My Lady Jane"? If so, tell me what you thought down in the comments! If not, tell me some of your favorite historical fiction -- accurate or not. If you enjoyed this review, please consider supporting me on Patreon. You can either click the button at the top of the page that says "Become a Patron," or you can click HERE. Patrons get to vote in exclusive polls, as well as access to cool stuff like free books. As little as $1 a month is a huge help to me. Even if you can't become a Patron, I hope you subscribe to this blog! (Again, the button for that is at the top of the page.) Thanks!